here’s how we spent our tuesday. and you? Here’s what’s turning us on today in Goa…..an unexpected unplanned facetime videoconference with Dad and sista Lindy calling from California…..an amazing video of a storefront in Berlin that Lindy sent to Scott who LOVED it ( “the best ever, a must see for all my friends! 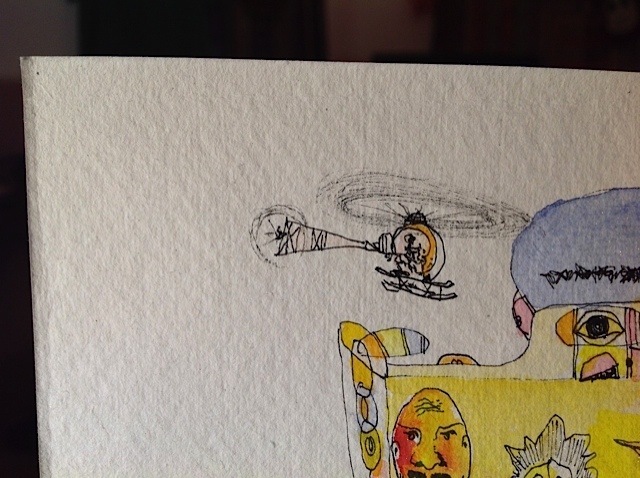 “)….another unplanned video call on skype this time from Katy’s brother Roy in Oregon….. a visit from Dhiraj the local Apple computer store genius to help Scott make videos with his computer….a long nap….an orange protein shake….an eagle diving and catching a fish…a walk for Katy along the shore path….this helicopter detail from a new painting by Scott…. This entry was posted in Uncategorized and tagged art, artist, Going to Goa Blog, Katy Allgeyer, Scott Morgan, traveling with cancer, Watercolor painting. Bookmark the permalink. Quite a full day… Sounds like the move was a good choice! Love n hugs to you both.